Our Mecha’thun Warlock deck list guide goes through the ins-and-outs of this newly popular Warlock build for the Rastakhan’s Rumble expansion! This guide will teach you how to mulligan, pilot, and substitute cards for this archetype! Warlock’s Mecha'thun combo was theorycrafted already before The Boomsday Project cards were playable: with Mecha'thun in hand, play two Galvanizers to discount it to eight mana, and after you have drawn your entire deck, play Mecha'thun, Bloodbloom, and Cataclysm – all minions are destroyed and your hand is discarded, and therefore Mecha'thun‘s Deathrattle wins you the game. This is one of the most powerful Mecha'thun combos, because you generally do not have to worry about cards in your hand or about minions on the board. 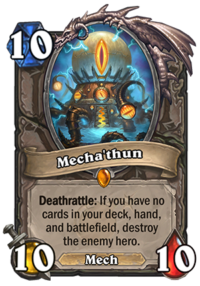 Other Mecha'thun decks have to empty their hands first, but Warlock is flexible about that, which also makes it difficult to interrupt the combo: should the opponent delay the combo with Mojomaster Zihi, for example, Warlock will still have other cards in hand that can be used to survive until they reach ten mana again. There are some small caveats to consider, though. After Bloodbloom, Cataclysm will cost four health, so the Warlock has to have at least five health remaining to pull off the combo. Furthermore, Cataclysm wipes out the entire board, so a Saronite Taskmaster on the opponent’s side of the board would cause the combo to fail, as it summons a minion for the Warlock from the Deathrattle. However, because Warlock can have other resources left when they go for the combo turn, that too is but a brief delay. With such a powerful finisher, the next question is what kind of deck should be built around it. Early Mecha'thun Warlock decks were often variants of Control Warlock or Even Warlock, incorporating the combo as an alternative finisher for games that reach fatigue. These were generally unsatisfactory, as they spent multiple card slots for a combo that they often had a hard time using: Voidlord, for example, has significant anti-synergy with the combo thanks to its Deathrattle that summons Voidwalkers. Slowly, a faster, completely combo-focused variant became the go-to list for the archetype. 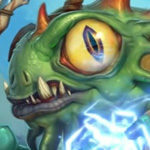 Schwah’s post about it on Reddit in December 2018 began its rise, and the most solid version of the list was developed by Tars for Europe Winter Playoffs in January 2019 – a list that held its winrate steady even through the second Rastakhan’s Rumble balance patch. This is the current Mecha’thun Warlock: a fast-drawing combo deck that goes through its entire deck rapidly while defending and healing itself and unleashes an inevitable win combo once it has drawn all of its cards. This version of the deck was brought by Tars to Europe Winter Playoffs. Check out alternative versions of this deck on our Mecha’thun Warlock archetype page! Corpsetaker – Your main defensive tool: Lifesteal, Taunt, Divine Shield. Kobold Librarian – Strong one-drop that can start to challenge the board and draw you more cards. Defile – Your main board clear. Acolyte of Pain – Card draw engine that the opponent needs to pay attention to, either it draws you several cards or the opponent uses resources to remove it. Lesser Amethyst Spellstone – Early removal spell, especially good with Kobold Librarian. Gluttonous Ooze – Keep against Rogue, Paladin, and Warlock (in anticipation of Cubelock). Mortal Coil – Potential keep against expected early tokens. Acolyte of Pain – Strong card draw engine. Kobold Librarian – Early card draw. Novice Engineer – More unconditional card draw. You see where this is going, right. Mecha'thun – Keeping this enables you to use your Galvanizers as they are drawn. 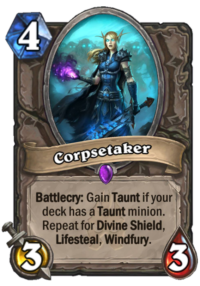 Corpsetaker – If you’re uncertain whether you need to defend or not, it is better to be safe than sorry. Mecha’thun Warlock has only one win condition, the Mecha'thun combo described in the introduction to this guide. 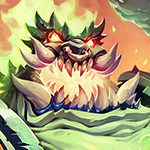 Even against aggressive decks, you are most likely going to end the game with the combo unless they concede after running out of gas, but in a world of Deathstalker Rexxar, Myra's Unstable Element, and Divine Favor, running out of gas is often temporary, even for an aggressive deck. Therefore, you will still be drawing towards your win condition and you do not want to spend your combo pieces for defense. Other than that, you will need to find ways to defend yourself effectively while drawing more cards. Your main defensive tool is Corpsetaker, as it provides both Taunt and Lifesteal, invaluable assets for a deck that will damage itself either through Kobold Librarian or simply the use of the Warlock Hero Power. You can stall the game to an extent with Corpsetakers, Wax Elementals, and Glacial Shards, which will help you save your board clear spells for later. Your most powerful single-target removal is Lesser Amethyst Spellstone, but your means to buff it are limited: only Kobold Librarian and Cheaty Anklebiter (by shooting yourself in the face!) are able to increase the power of your Spellstones. Therefore, sometimes you want to hold on to these cards until you draw a Spellstone to buff. If at all possible, you want to set up a Defile turn where you have your Acolyte of Pain on the board in order to draw multiple cards from it. However, an on-curve Acolyte of Pain can also be important against aggressive decks, because it forces them to choose between hitting face and removing the Acolyte quickly. The deck gives you tons of ways to use Defile. You have a large variety of low-health minions to fill in any gaps on the health numbers on the board in order to make your Defile go on and on. You can buff the first hit with Bloodmage Thalnos, you can Mortal Coil a minion to set up the health totals, and you can Cheaty Anklebiter a minion while also getting a one-health minion on the board. Many of the same tricks apply to Lord Godfrey. While Bloodmage Thalnos cannot buff Godfrey’s effect, getting some low-health minions on the board can help and getting some pings with Mortal Coil or Cheaty Anklebiter can set up the board for a full clear. Another nice trick is to Magnetize your Zilliax on a Galvanizer – Galvanizers are Mechs too! Not only that, but they discount both Mecha'thun and Zilliax, and can enable surprising Lifesteal Rush plays from hand, especially important in survival against aggressive decks. Against Control decks, you are not under so much pressure and can focus more on drawing cards. 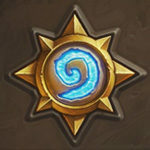 Most control-style decks right now are actually combo decks, so it becomes a race to find the win condition before they find theirs. 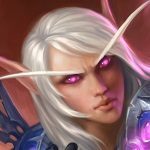 Fatigue-style control decks are just auto-wins, but don’t expect to meet many of those. When you draw a lot of cards, you also want to be able to play a lot of cards. Therefore, keeping Mecha'thun in the mulligan is useful, because that allows you to play your Galvanizers as soon as possible. Otherwise, Galvanizers may end up clogging your hand for some time and prevent you from effectively getting rid of cards. 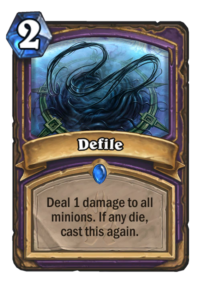 Try to set up Acolyte of Pain with Defile to draw three cards from it whenever possible. The Soularium is an interesting card, especially in control matchups. You cannot afford to lose combo pieces, and therefore you can only use it after you already have Mecha'thun, Bloodbloom, and Cataclysm in hand. You also need to make sure you have enough mana to play any Galvanizers you draw so that they do not end up discarded. Use your Hero Power liberally. You want to draw cards, and your Hero Power is always there for you to draw more. Once you have all the combo pieces in hand, you can use your Hero Power to draw cards even if your hand is full: burning those cards no longer matters, all that matters is reaching the end of the deck. When playing against Priest, beware of Psychic Scream. Remember that you will never win through damage anyway, so do not hesitate to clear your own board in the mid-game to prevent the Priest from screaming your minions back to the deck. Sometimes, a Priest may scream their minions to your deck when you’re about to combo them down, but as you do not need to empty your hand for the combo turn, you can usually survive such a delay, unless the Priest can then assemble lethal damage in the following turn. Your Mecha'thun combo typically costs 10 mana, so you cannot do anything else on that turn. However, against Priest you sometimes can, because if a Galvanizer gets screamed back to the deck, you can then use it again to discount Mecha'thun further. This can enable a surprising The Soularium to draw the rest of your deck on your combo turn – something you usually have no mana for. When playing against Druid, beware of Naturalize. Druid can make you draw more cards and potentially burn some of your combo pieces. Try to maintain a hand size of seven cards until you find your combo pieces. Mecha’thun Warlock is a fairly expensive deck: the standard list costs around 11,000 dust. Mecha'thun, Bloodbloom, and Cataclysm are required for the combo and cannot be replaced. The other expensive cards are all high-performing pieces of the deck and replacing any of them will hit the deck hard. That said, I will go through the non-essential expensive cards in order of replaceability to give you some idea of what can be done. Gluttonous Ooze: The only real tech slot in the deck, so Gluttonous Ooze can definitely be replaced. Acidic Swamp Ooze is a budget replacement, or you can go for some other tech entirely, although most good tech cards, such as Voodoo Doll and Twisting Nether, tend to be Epics themselves. Bloodmage Thalnos: While the synergies with Defile, Mortal Coil, and Lesser Amethyst Spellstone are useful, Thalnos is the least mandatory Legendary card in the deck. Potential replacements are Loot Hoarder (for more draw) and Tainted Zealot (for spell damage), depending on the meta, with slight preference going to Loot Hoarder as the deck really likes to draw cards. 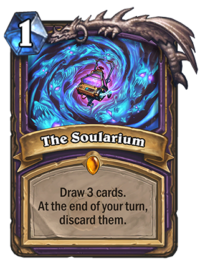 The Soularium: Drawing three cards for one mana is nuts. If you really have to let it go, you can put in a Loot Hoarder to draw one card for two mana. It’s not quite the same, I know. Zilliax: You have Wax Elemental and Cheaty Anklebiter to support your Corpsetakers, but cutting Zilliax would still be a consistency hit, not to mention how good Zilliax is purely on its own. Sunwalker can try to act as a replacement. Lord Godfrey: One of the best board-clear tools in the game. How do you even go about replacing that? Twisting Nether is the most direct replacement and Hellfire is a budget option. Corpsetaker: The cornerstone of your defense line. I don’t think it can be successfully replaced, even though it is technically not part of the combo. Tar Creeper, maybe? As you can see, there’s a big difference between the two. 1: If you don’t get an early Corpsetaker against fast decks, or if it gets silenced, you’re going to have a bad time. 2: The Solarium can often be a dead card if you’ve not drawn any of the three important combo cards. 3: Only 4 (potential) self-harm cards isn’t really enough to reliably boost the Spellstone. It’s a little slower but I found that as soon as your opponent realised you were playing Mecha’thun they’d pretty much ignore your board and go face – I found the swaps improved my survival rate through the early game and made the Spellstones more reliable. YMMV of course. I dusted 1 month ago all my wild sets (since 2014), since i don’t play them for years now. 45k dust earned but i still don’t want to craft cards just for 2 monthes. Ok, that´s reasonable…I play wild and arenas, so, i have no standard cards except cards for free. I´m in different situation.